The Argan & Bergamot Organic Treatment Oil from Lucy Annabella Organics smells amazing with a blend of lemon, bergamot and lavender - some of my favourite scents! I've used it as a body oil and it leaves skin super hydrated. I usually tend to avoid soyabean and rapeseed oil, but in this case the ingredients are all organic and I enjoyed using up this sample. I haven't tried anything else from the brand, but you have to check out their website to see how gorgeous their full size packaging looks with the botanical illustrations! 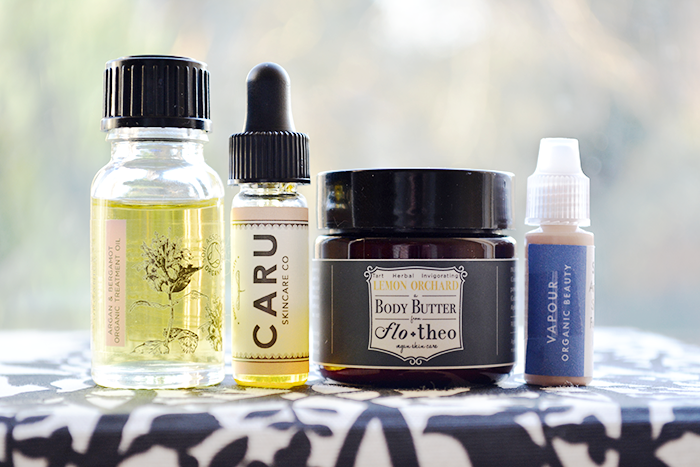 Caru Skincare Co are an NYC based brand that have had a lot of attention in the green beauty world this year! I received the Rose Facial Serum in my last Petit Vour box* and although I'm not a fan of rose scents, this one is quite mild so I was intrigued to give this a try. Unfortunately this just isn't right for my skin at the moment, but I imagine it would be much better suited for mature skin! Another sample from Petit Vour and also based in NYC is from a new-to-me brand Flo + Theo. Their skincare products are 100% vegan and made with simple yet effective natural ingredients. The Lemon Orchard Body Butter has the most amazing lemony scent that reminds me of sherbet sweets! I really loved using this and I hope Flo + Theo will available in the UK sometime in the future since I would love to buy some of their products! My last one for today is a little sample of the Vapour Atmosphere Soft Focus Foundation I ordered from Naturisimo. I tried this once before last year and couldn't stand the scent (frankincense I think?) but the shade 115 is a perfect colour match for me so I wanted to give it another try. I like the coverage it gives, but since it's an oily foundation the finish is much too "glowy" for me and I still can't put up with catching a whiff of the scent throughout the day! I wish I liked this more, but at least my bank balance is thanking me! I also have this Caru serum, but I have yet to try it. I think I will put it in my queue of samples next. I don't have mature skin (at least I hope not, lol), but I've been staring at it for a while. It certainly doesn't have that annoying rose scent which is great.